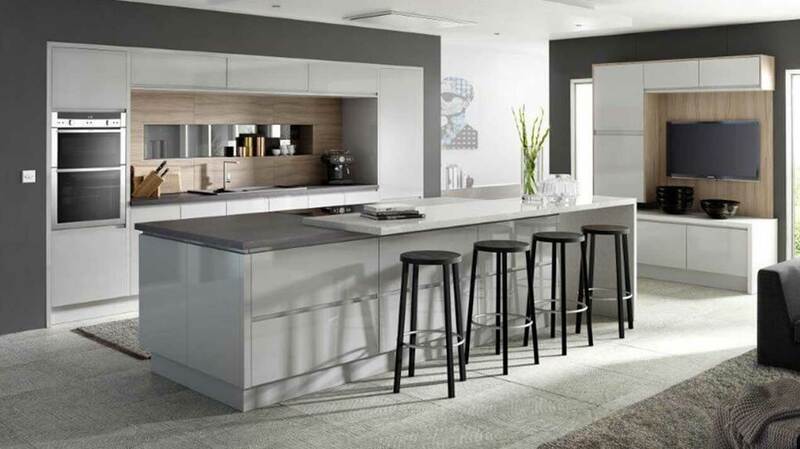 As far as creating a fitting centerpiece to a modern home, this kitchen does the job and then some. 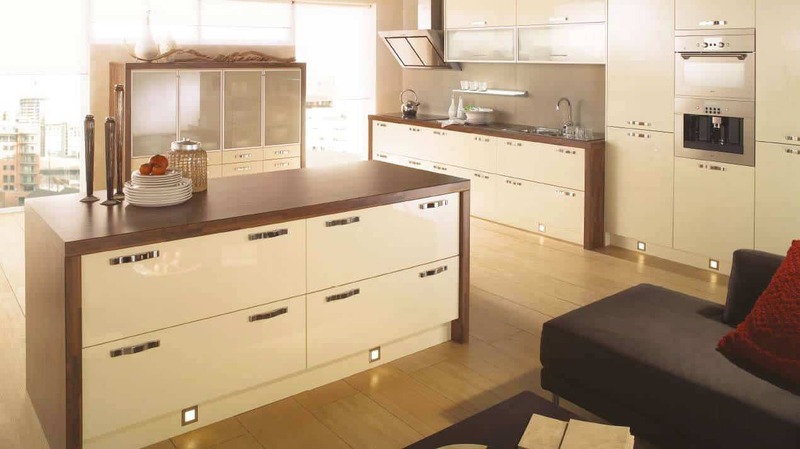 Its unique style and significant storage space make for an unforgettable design. 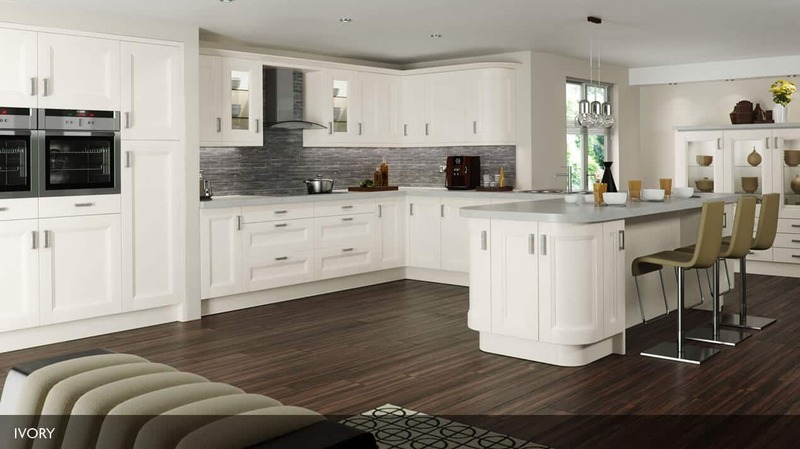 Individuality and simplicity are the key features of this breathtaking kitchen, which would compliment any home lucky enough to feature it. This is available in Anthracite, Cashmere, Ivory, Light Grey, Truffle and White. 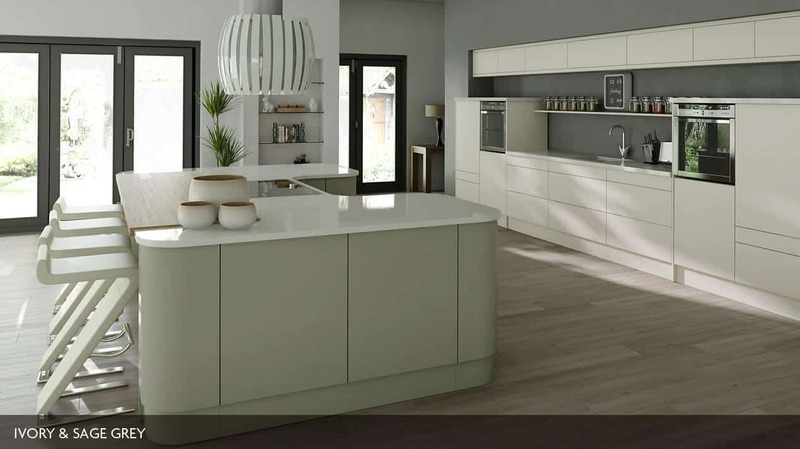 To add impact to your home whilst crafting a unique ambiance, why not take a look at this kitchen, which has a lacquered high-gloss finish with more subtlety than similar kitchens. 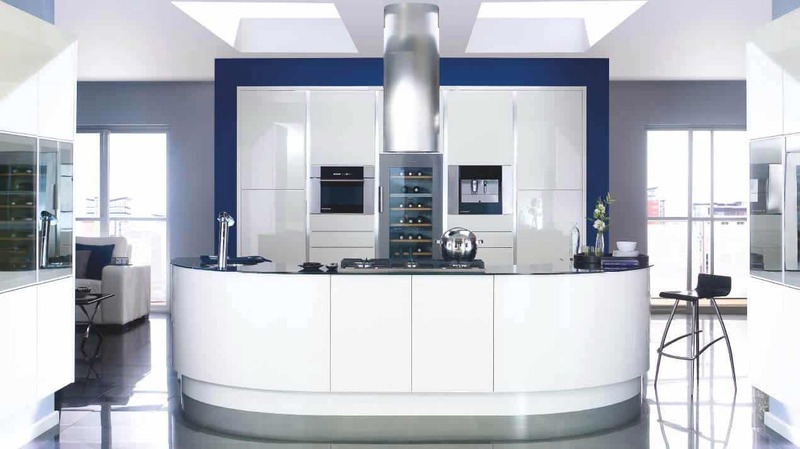 Another awe-inspiring statement kitchen with the much sought after lacquered high gloss finish, contemporary lines and handle-less design. 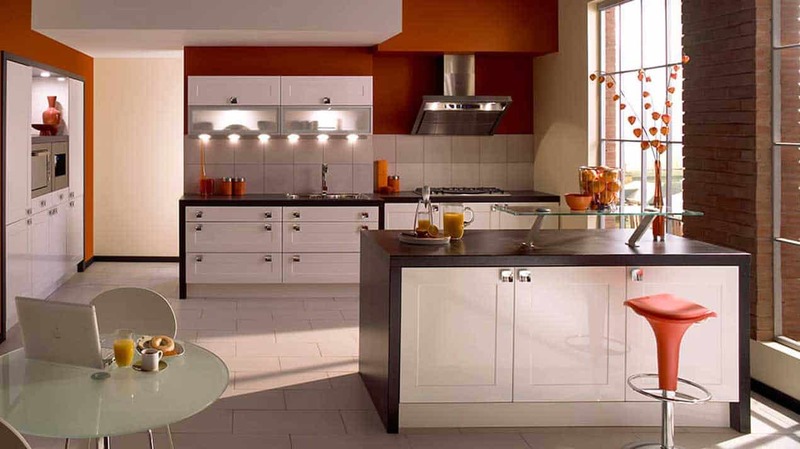 Warm colours are all the rage in the modern home, and there’s no finer example than this beautiful gloss kitchen. Adding to the allure is a plethora of clever design features. 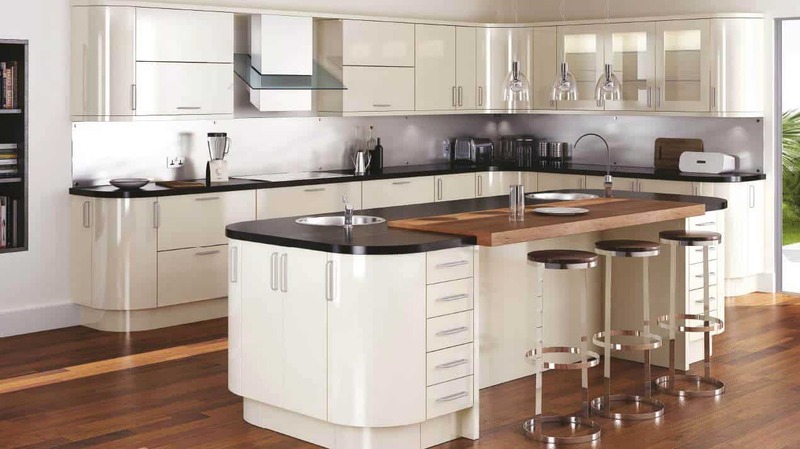 Those pining for a kitchen that screams style and fashion, this is the clean lined design of your dreams. Modernity and style combine in the most effective way. 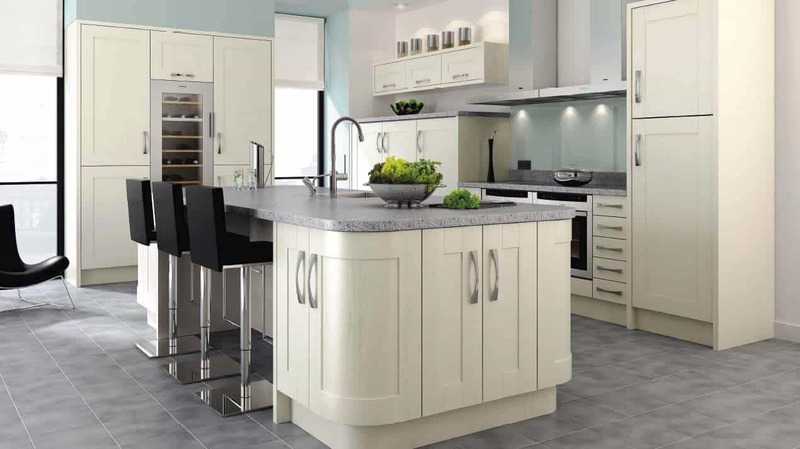 Gorgeously streamlined and on-trend, this is another handle-less kitchen with style and subtlety in abundance. 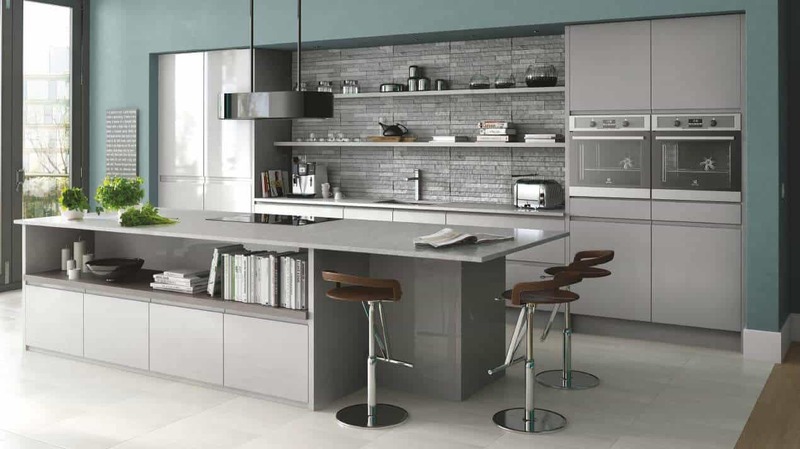 Much like the Lucente White, this kitchen is for those with the most contemporary sense of style. 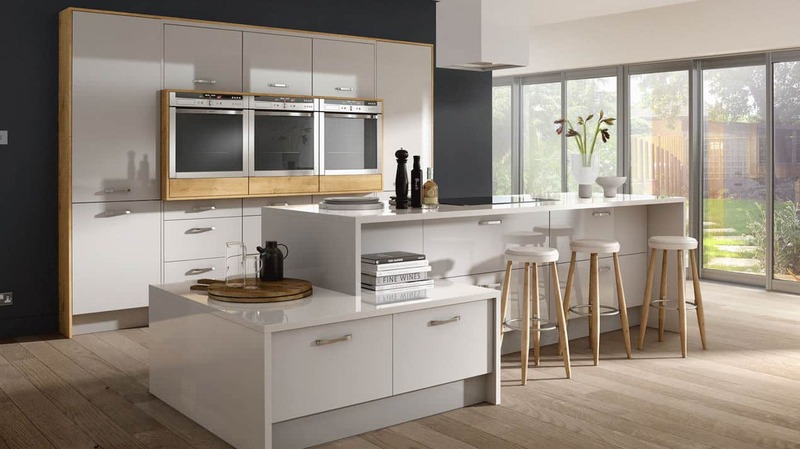 With a high-gloss ivory finish, it combines class and a modern edge. Also available with handles. 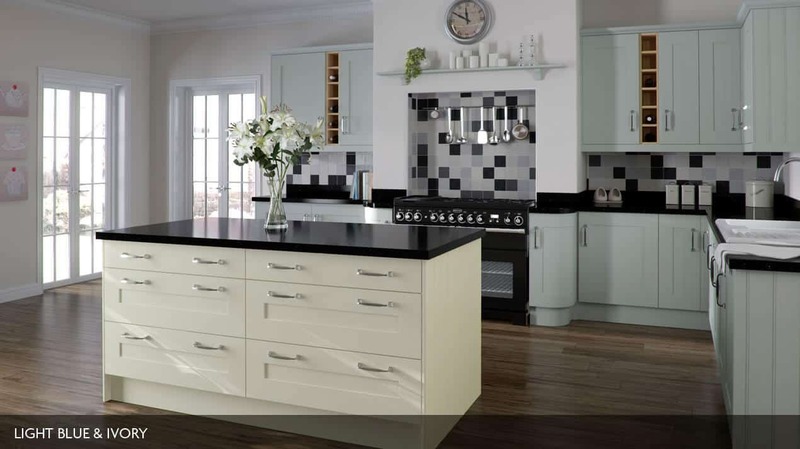 This high gloss kitchen looks every bit the modern masterpiece, with contemporary curves and a handle-less design complimented by its lacquered finish. 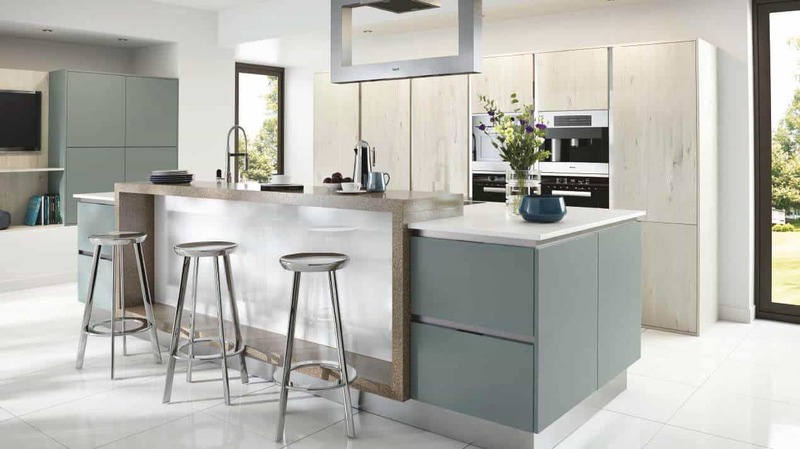 Bold and graceful in its shaker design, this kitchen also combines the best of both form and function within its multitude of features. 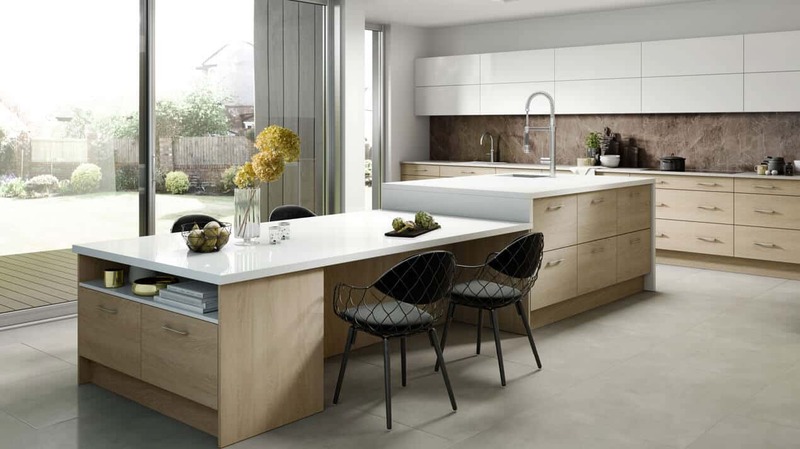 A stylish and natural kitchen with solid ash frames and soft chamfered edges. Also available in 15 different colours. The clue is in the name. 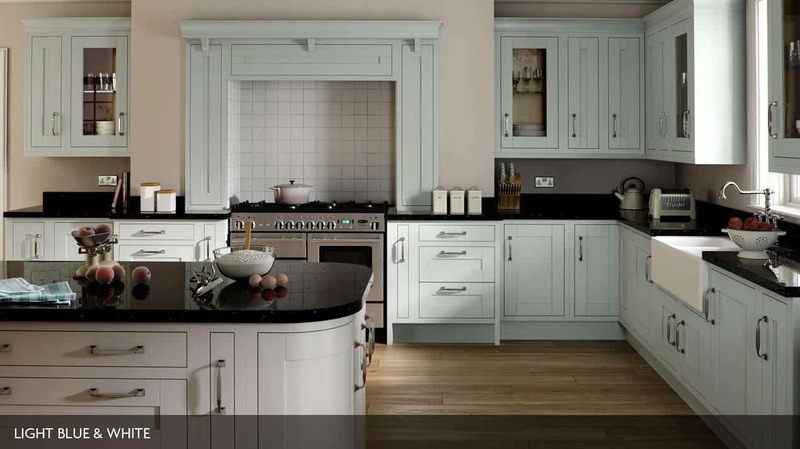 This elegant painted kitchen is built in a classic shaker style, with gorgeously smooth one-piece doors and a choice of 15 colours. An 18mm thick, PVC wrapped, MDF shaker door in a smooth finish. Available in a choice of four colours: White, Ivory, Light Grey & Cashmere. 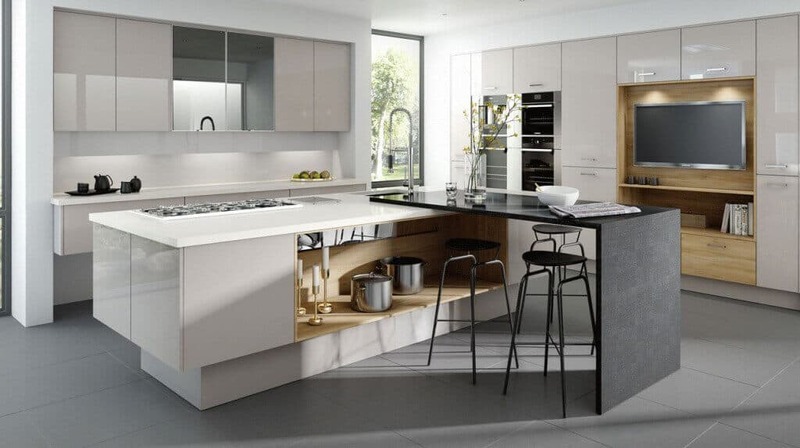 Stunning and minimalist, this kitchen offers the best in contemporary design and functionality to match on-point tones and materials. 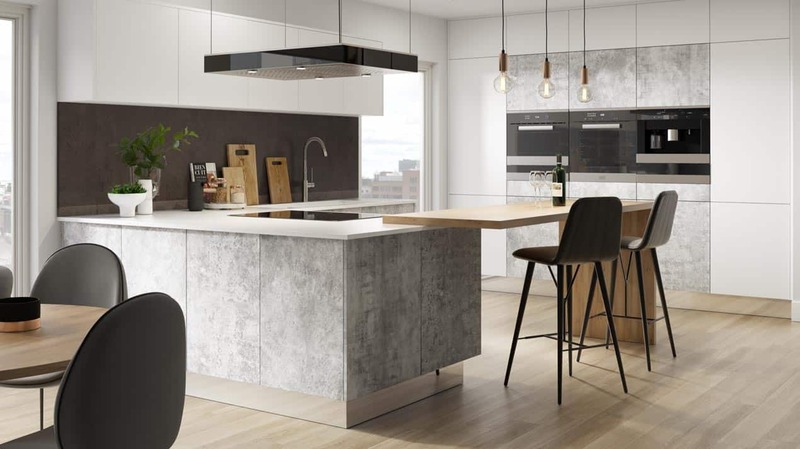 A kitchen crafted to feature a delicate contrast between tones and materials, providing the ultimate backdrop to modern day living. If you’re seeking out a kitchen that combines fashionable elements with minimalism, then take a look at this. 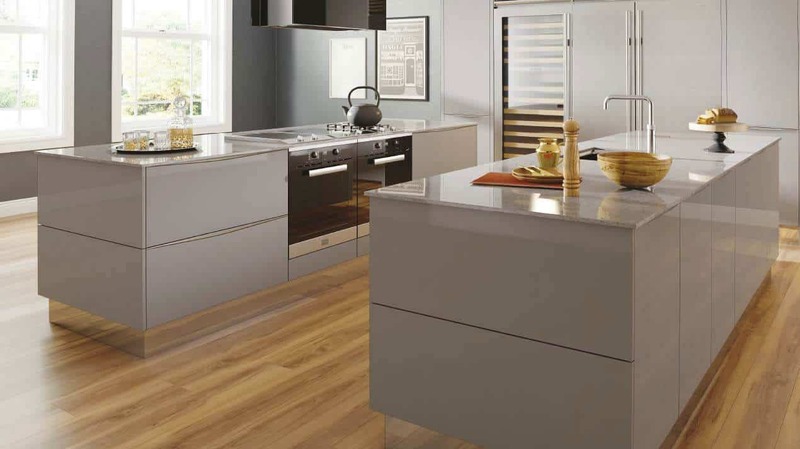 This features high-gloss slab doors and a modern grey finish. 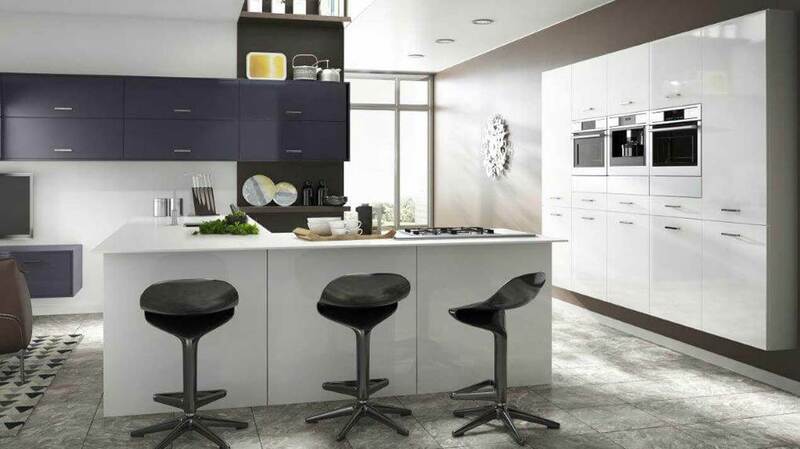 Functionality, fresh tonality and ultra-modern style all sit in unison at the heart of this statement kitchen. 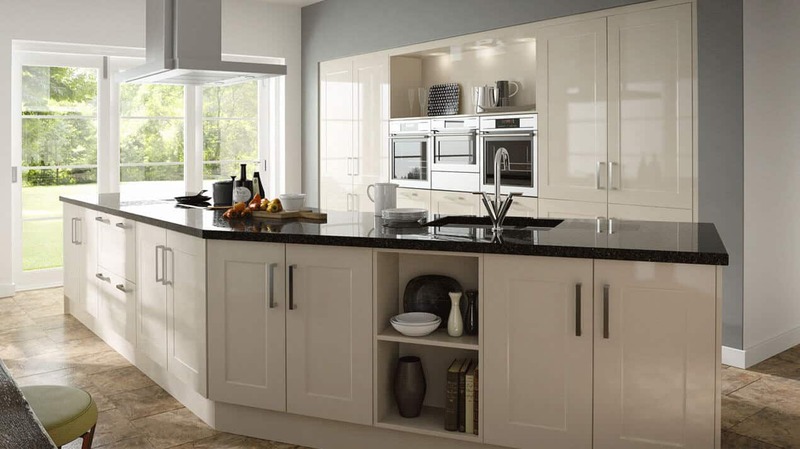 This on-trend kitchen has high-gloss slab doors for a stylish and classy look. 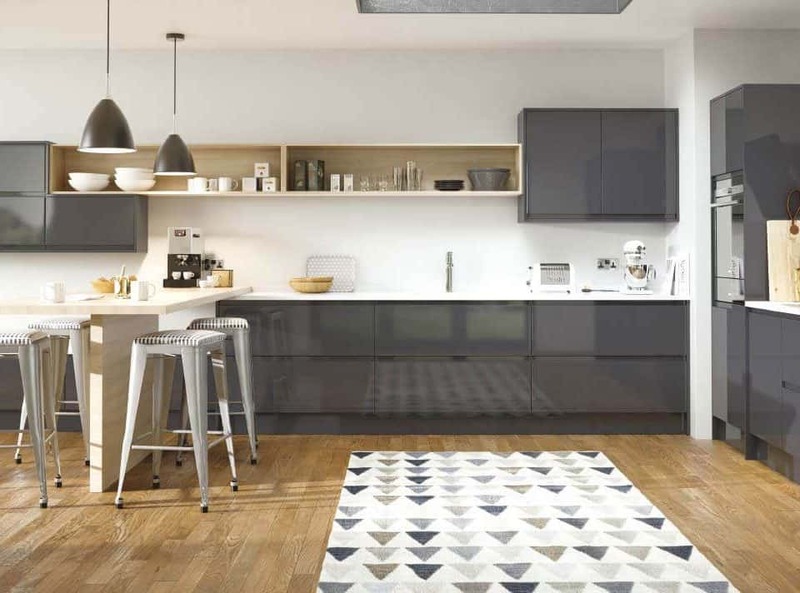 This handle-less kitchen gives you clean lines and a sharp design. It’s enough to make a big statement at the heart of any home. 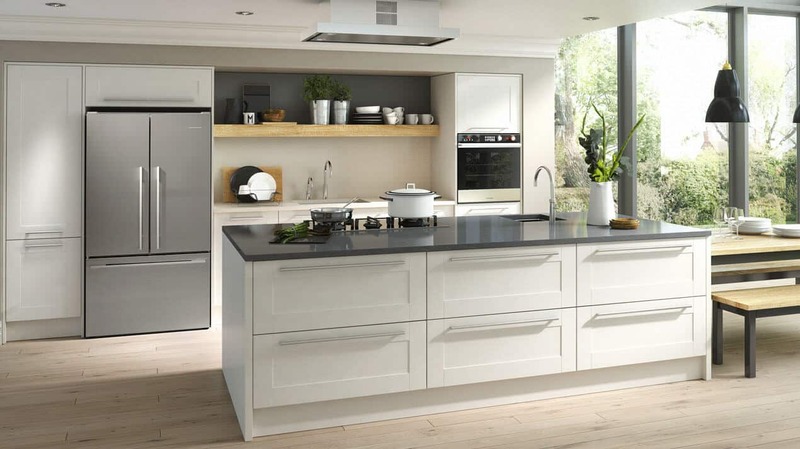 For something simple but effective, this kitchen has smooth painted doors in a slab-style, available in a varying range of 15 colours. 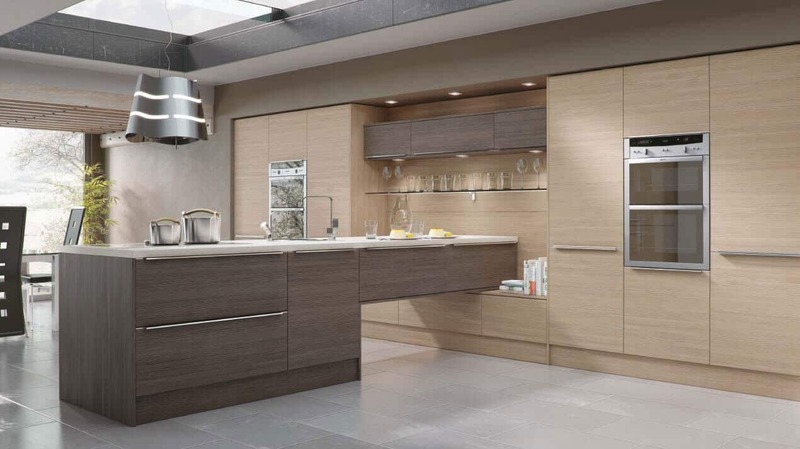 A modern design and finer details collide in this Amazonas kitchen, featuring the most luxurious woodgrain finish on the market. 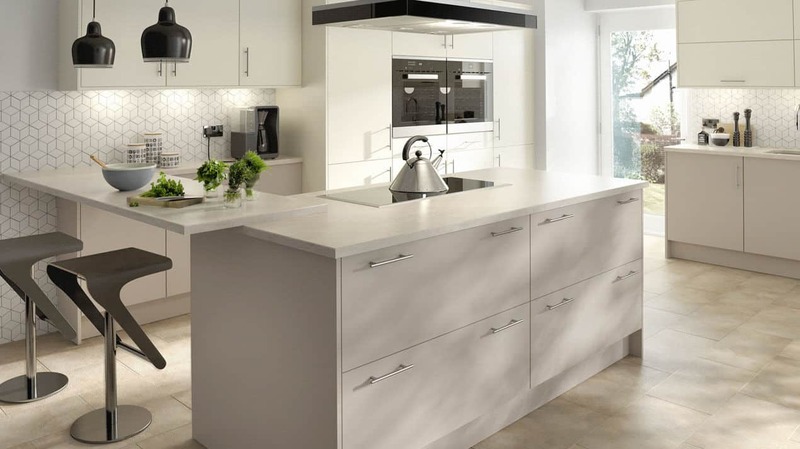 This Bellato Grey kitchen boasts a featured MFC slab door, which has a concrete finish and is 18mm thick. 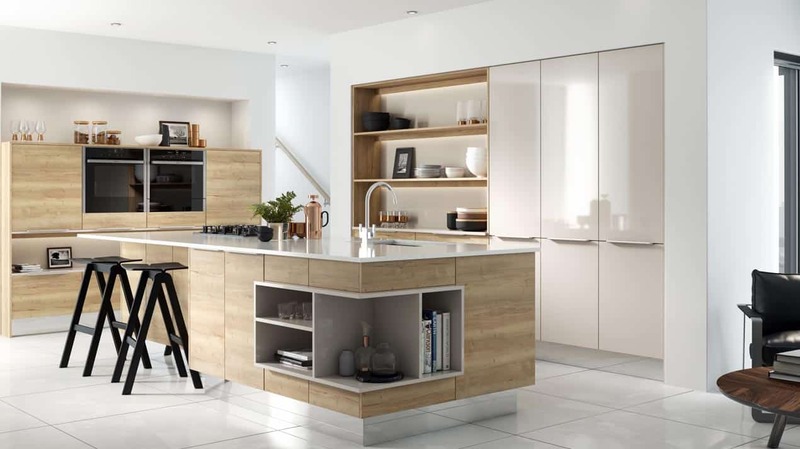 A contemporary and silky design, this stylish kitchen features refined woodgrain and a wide range of customisable elements. 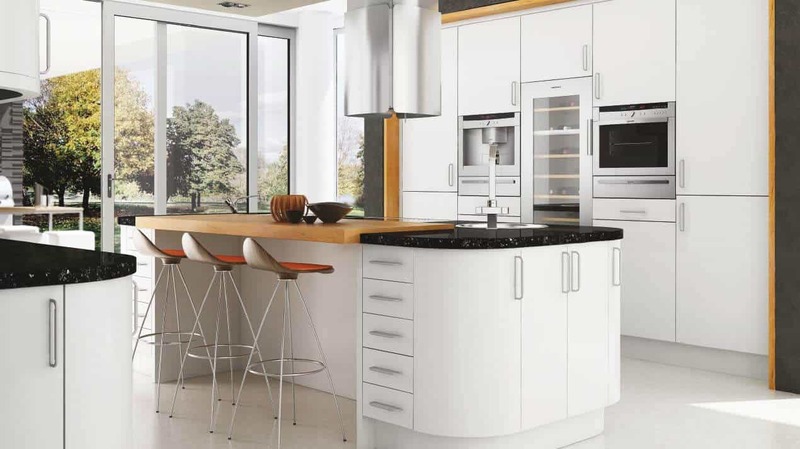 Crisp lines and an ultra-modern feel work in coordination with a warm color pallet in accentuating the overall minimalist style of this modern kitchen. 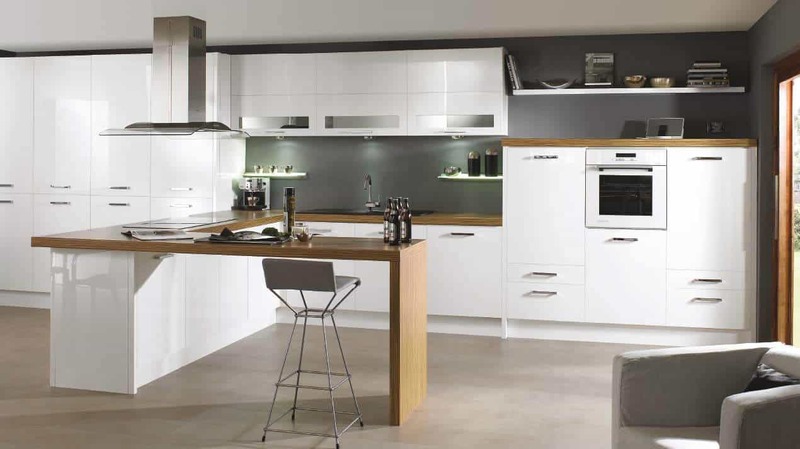 A clean and subtle modern kitchen with matte white doors and a minimalist look. 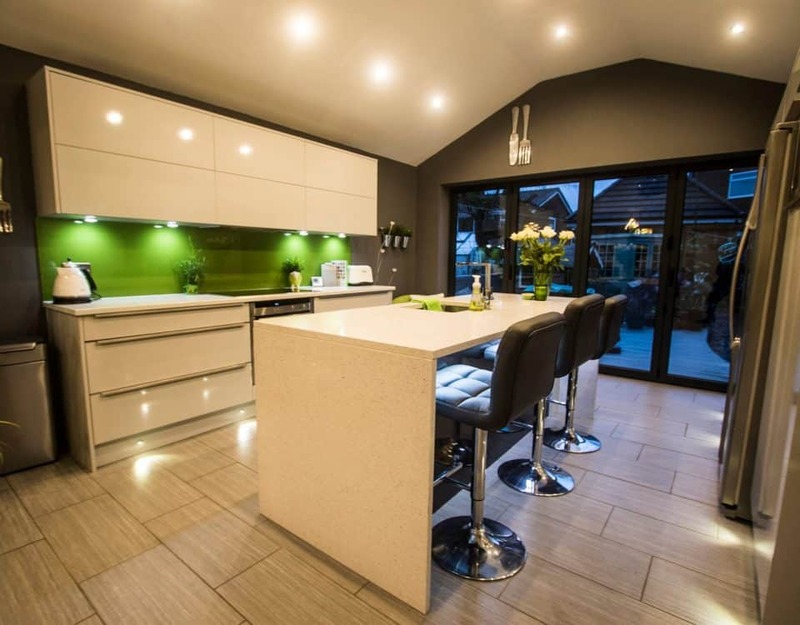 This stunning and fashionable kitchen makes a fantastic centrepiece to a home with dynamic design at its heart. 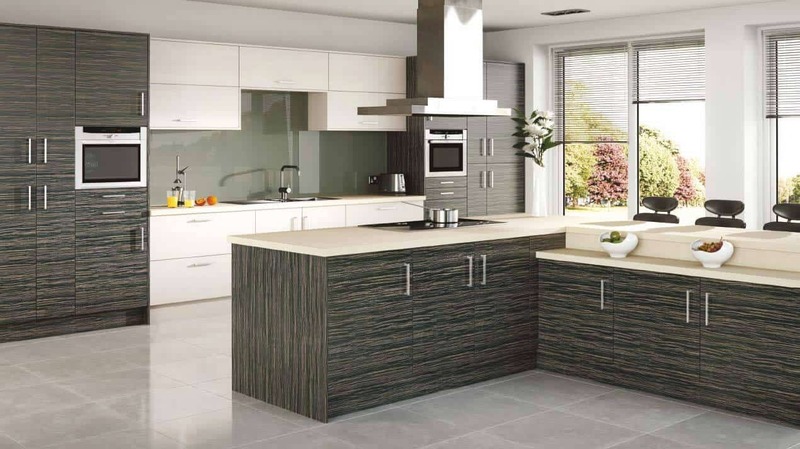 You can have this kitchen in one of horizontal or vertical woodgrain. 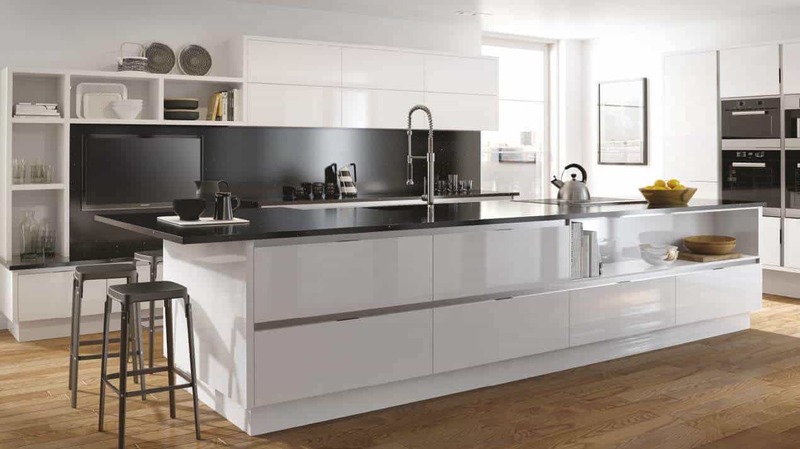 Super sleek surfaces and high gloss slab doors work together to complete a stylish contemporary kitchen with gloss ivory finish. 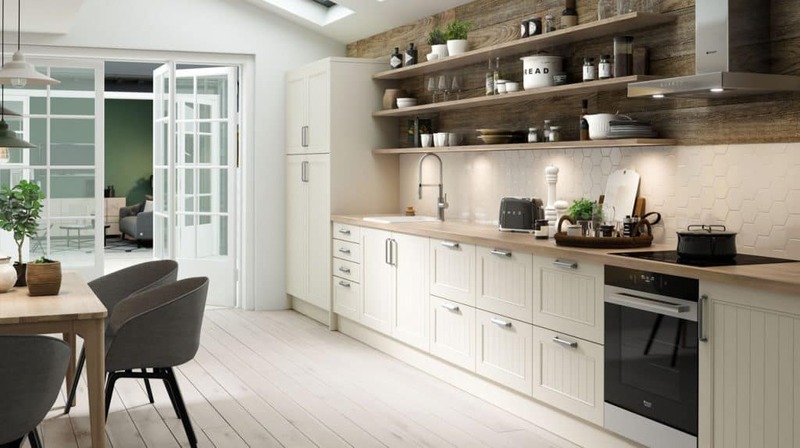 Shaker kitchens don’t come more stylish than this one, which features a woodgrain effect and an ivory finish to give your kitchen a more refined look. 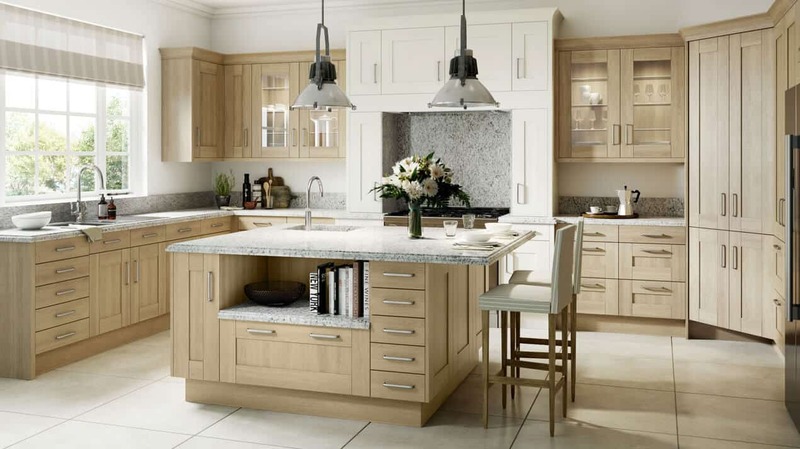 For a warm, medium oak shaker style kitchen, this option gives you all of that along with a highly distinctive five-piece shaker door. This is a perfect choice for the centerpiece of any home. 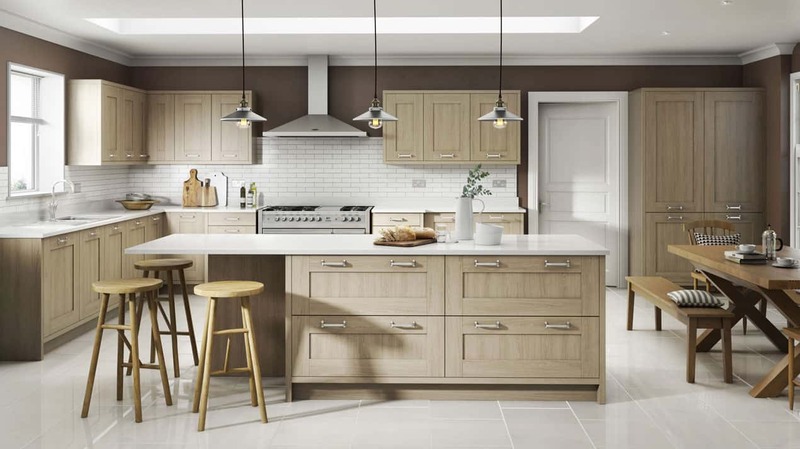 This striking kitchen includes impressive frames made of solid oak, naturally worn woodgrain for a more realistic effect, and a classic shaker style. An MDF Shaker-style door with integrated handle recess in a matte finish. Available in a choice of 14 painted colours. 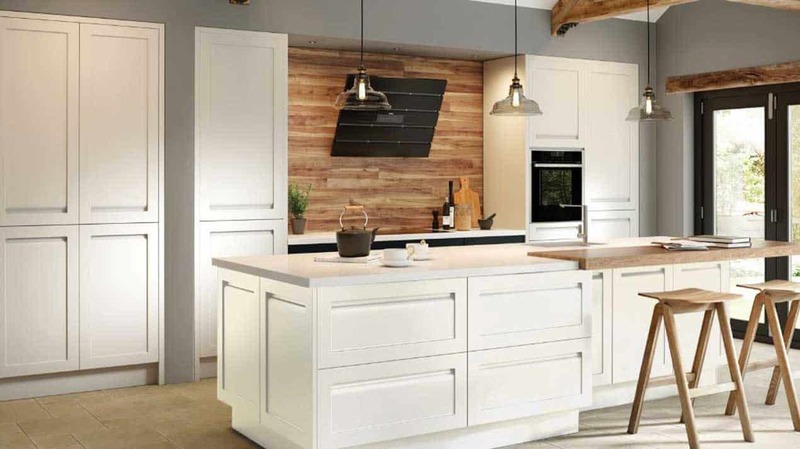 If you are looking for a classic timber shaker style, look no further than this painted wood shaker, which is available with a humongous range of fully customisable trims, accessories and features. 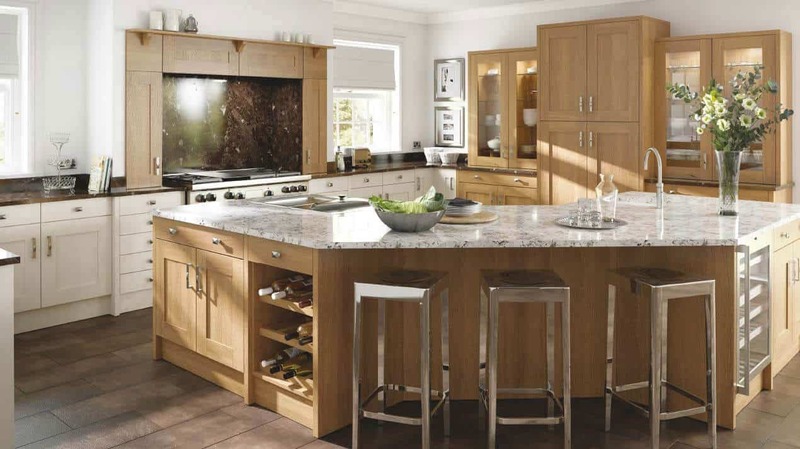 For a lighter woodgrain effect, go for the sand oak wood shaker kitchen. 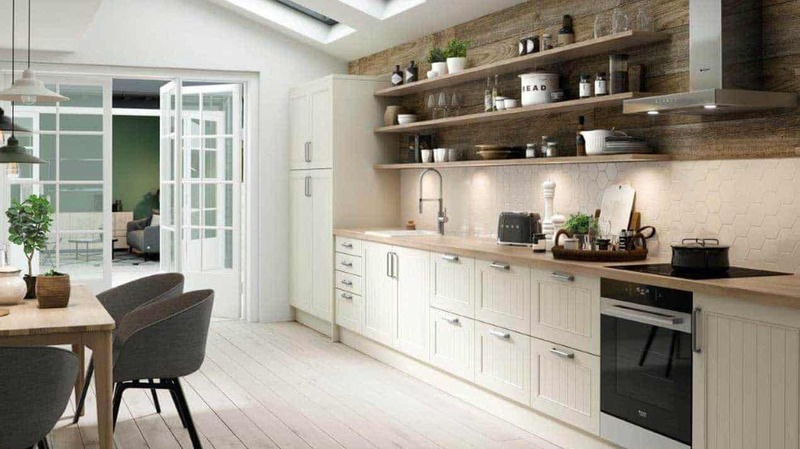 Aside from being a lighter option to brighten up your home, it also has many timeless features. 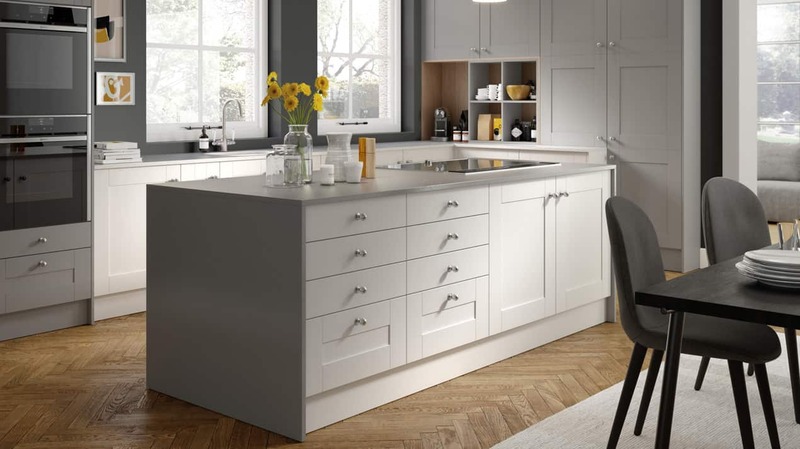 Carrying on that same trend of shaker kitchens with stylish substance is this painted shaker kitchen, which also has the usual customizable accessories, choice of 15 colours and a woodgrain effect. 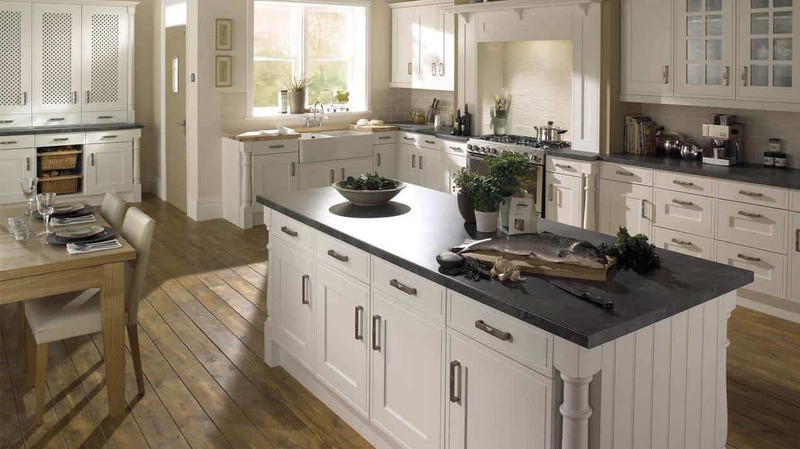 Is your home ethos one of a contemporary feel with hints of traditional throughout? 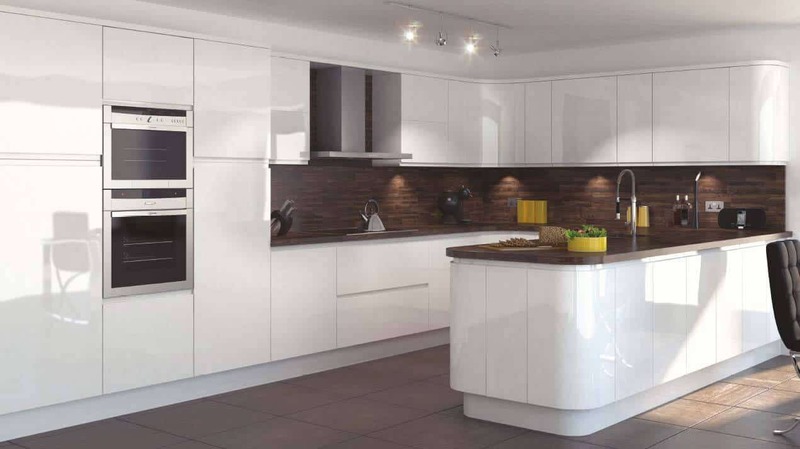 If so, then the Gloss White Shaker provides sleek modern lines and a high gloss finish with the classic shaker style. Have the best of both worlds. Elegance and style redefined. 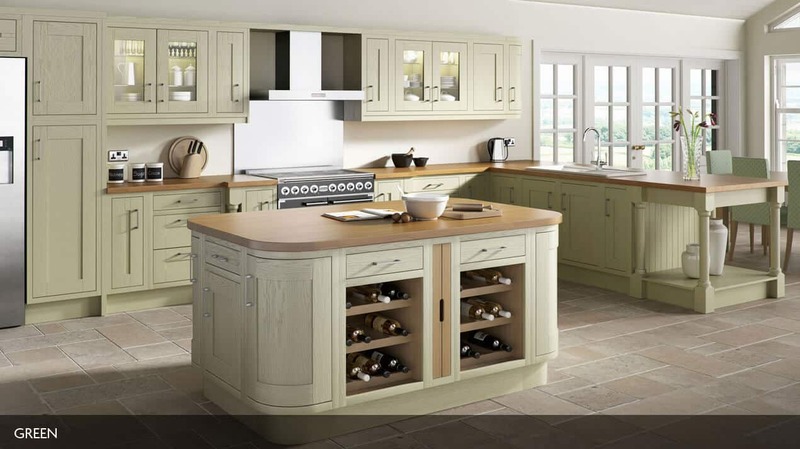 This shaker design features the ageless five-piece doors that shaker kitchens are renowned for, all of which boast a stunning woodgrain finish. 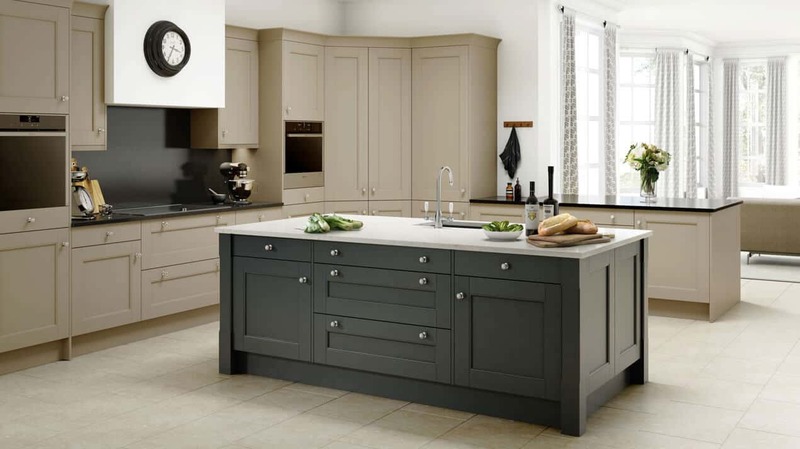 Structured with a solid timber frame, the character painted traditional kitchen is available with a wide range of features or accessories to further compliment your kitchen space. 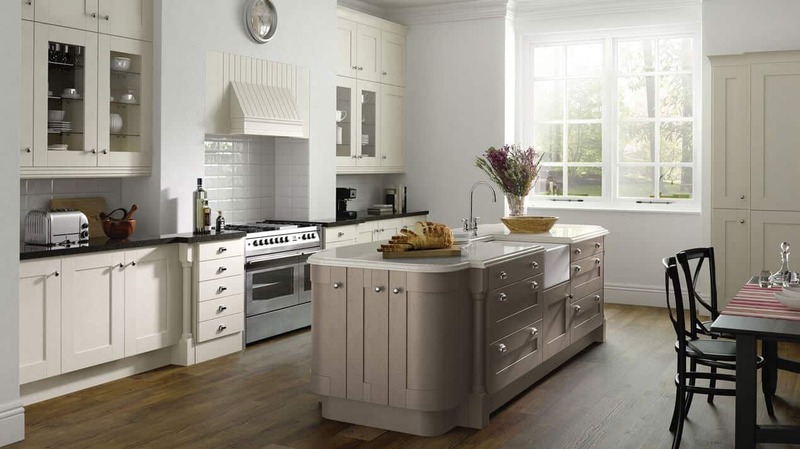 Another Edwardian classic, only this time with a choice of 15 natural colours. If platinum white isn’t to your taste, then take this chance to add your own spin to this old favourite. 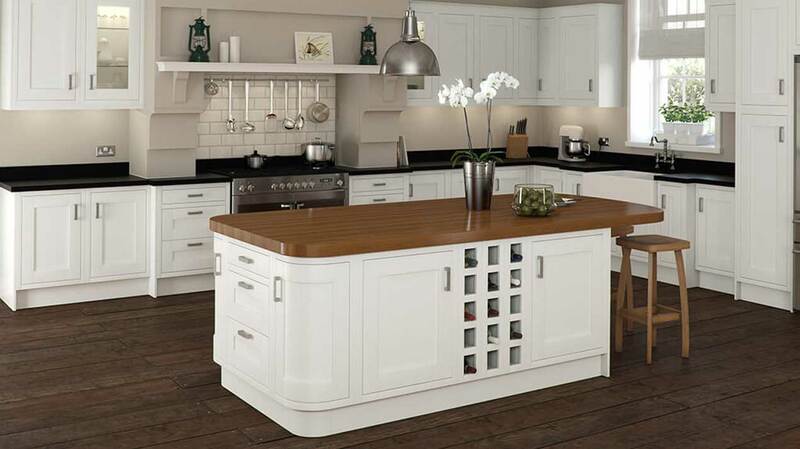 Perhaps our most simple kitchen of all, this platinum white offering is a classic that oozes style and practicality. Once again complete with in-frame doors, this a great choice for those looking to play it safe whilst maintaining a particular stylistic sensibility. 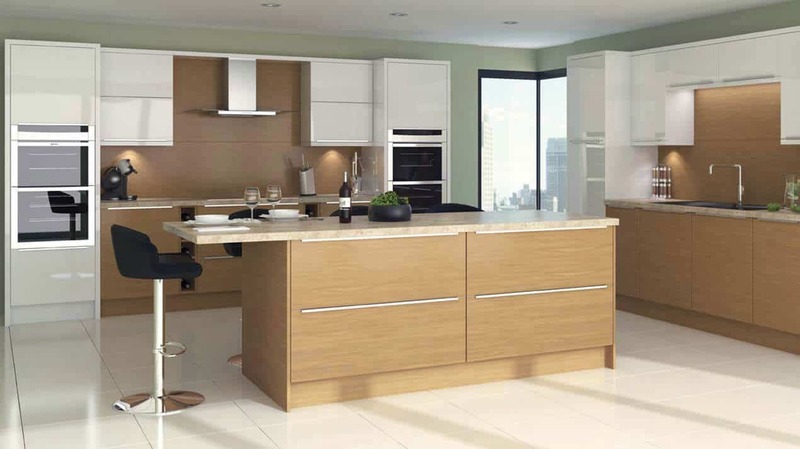 This option is elegant and classy, with an ivory coated woodgrain finish and gorgeous in-frame doors. 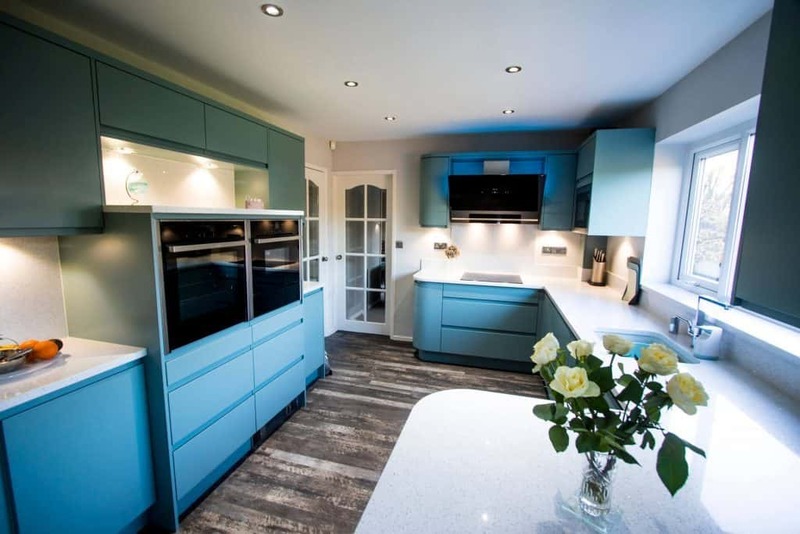 This traditional kitchen infuses a shaker style design with painted five-piece doors, along with veneered centre panels and beading. 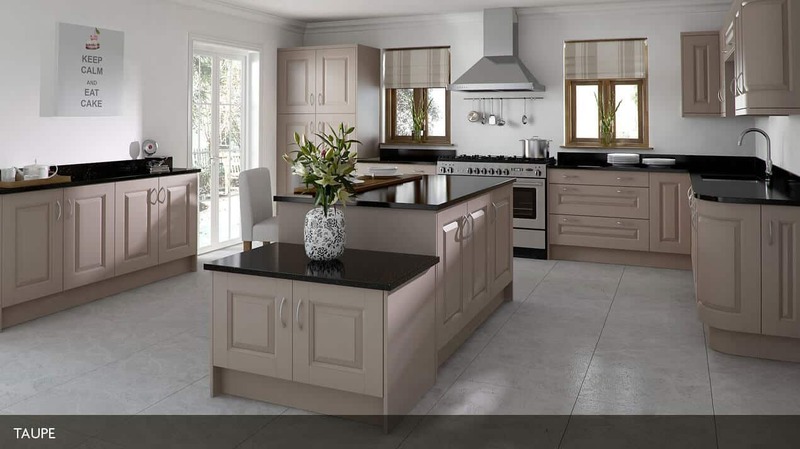 This kitchen has a majestic design that includes a painted woodgrain effect, classic in-frame doors and a huge selection of 15 natural shades. 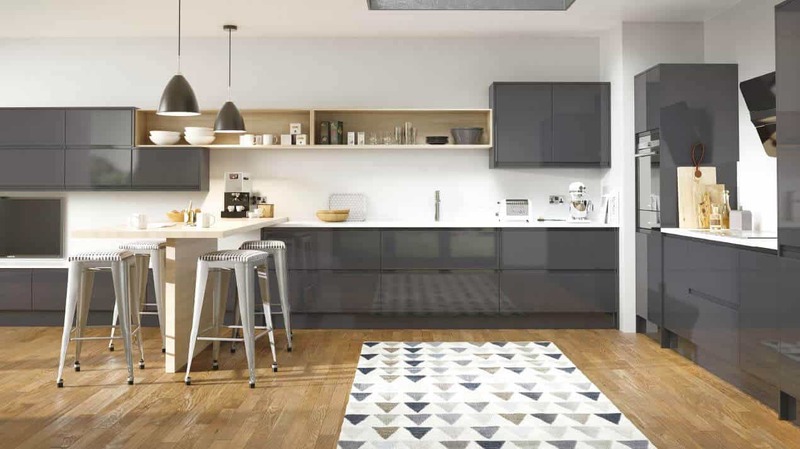 When it comes to the modern home, cubes are all the rage. 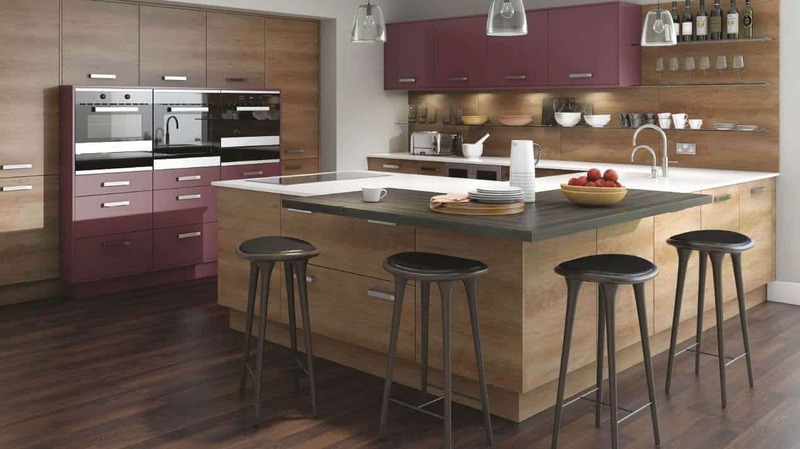 Recreate that enviable look with the smooth doors and complimentary colour schemes of this amazing modern kitchen. This is available in Anthracite, Cashmere, Ivory, Light Grey, Truffle and White. 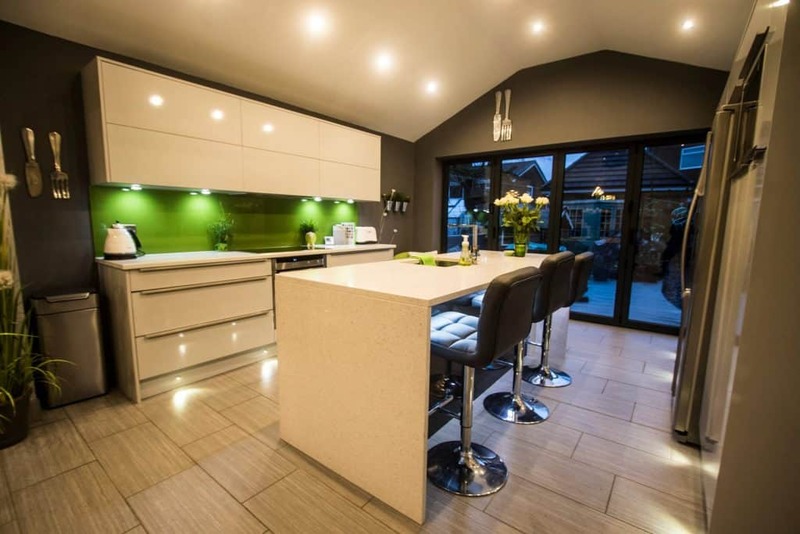 This kitchen combines incredible colour with equally incredible textures. 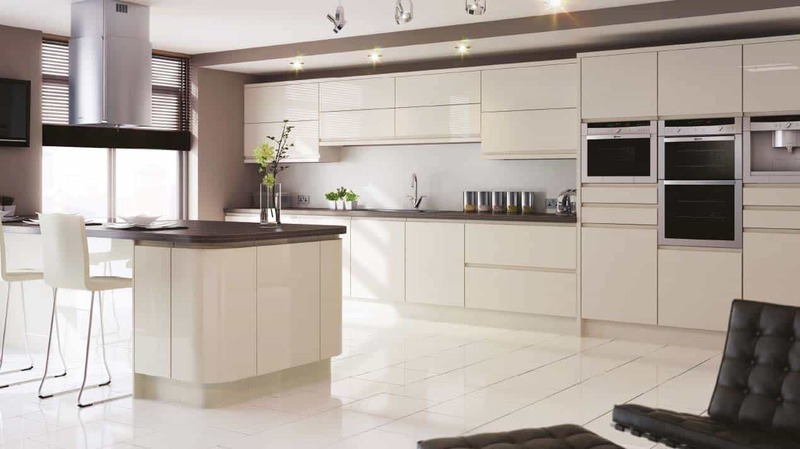 The stunning ivory works perfectly in unison with the groove centred panels to create a kitchen that is comfortable and easy on the eye. 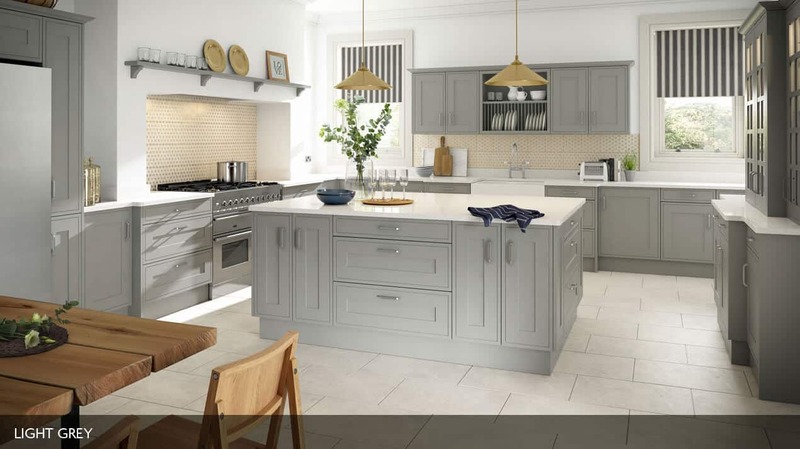 For a more traditional look, this kitchen has classic tongue and groove panels, and painted frame doors that would look the part in any classic home. To top all that off, it’s available in 15 painted colours. 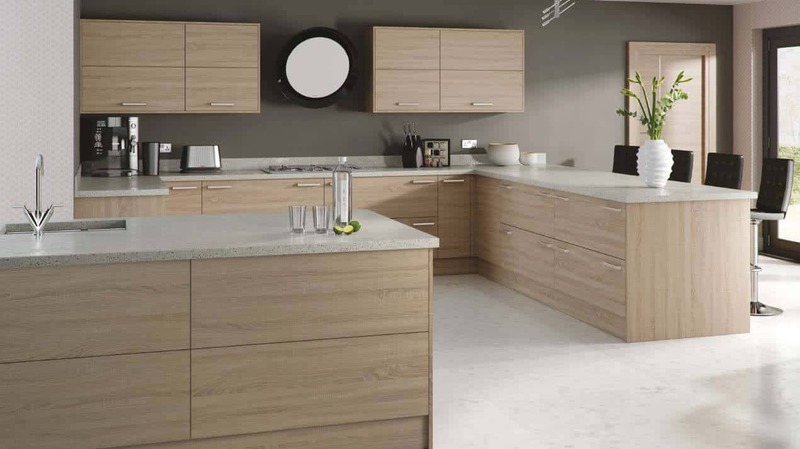 It doesn’t get more clean, simple and contemporary than this Woodgrain Lissa Oak Slab kitchen. This is another one for the minimalists. 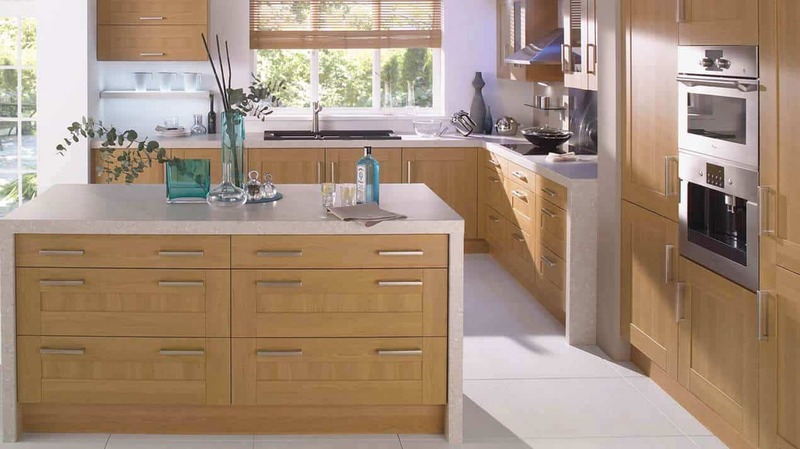 The mid-oak finish of this kitchen offers a more mellow alternative to the Gladstone Oak, for those seeking a calm and quiet kitchen space. 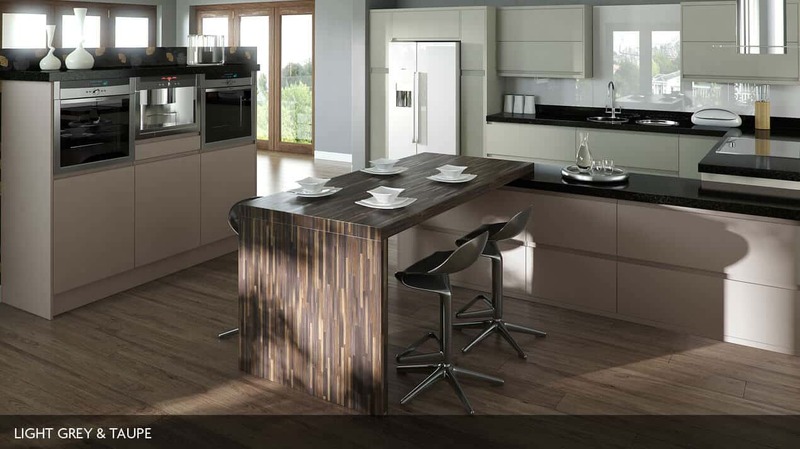 This unique yet classy kitchen offers an 18mm thick slab door in a rich and sleek dark oak finish, with a horizontal grain to add individuality. 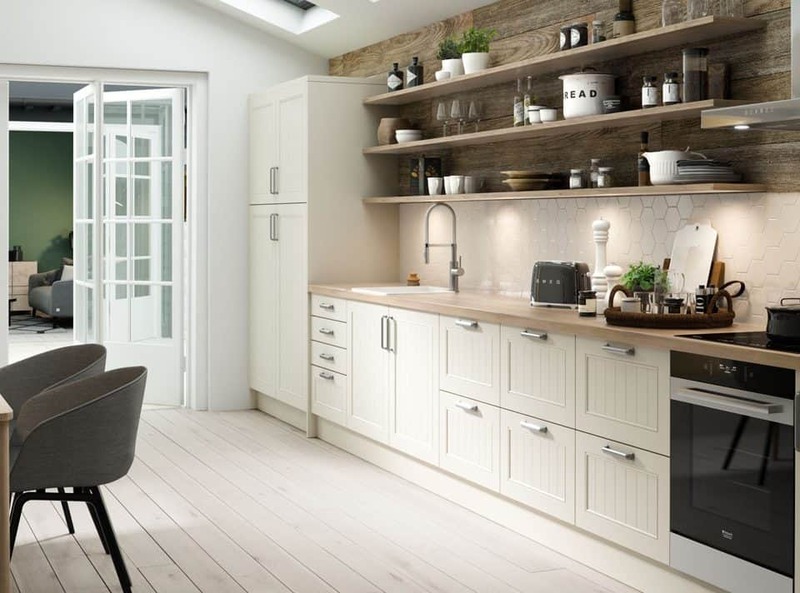 This kitchen has a breathtaking image that is further boosted by an embossed wood finish, as well as practical contemporary touches. 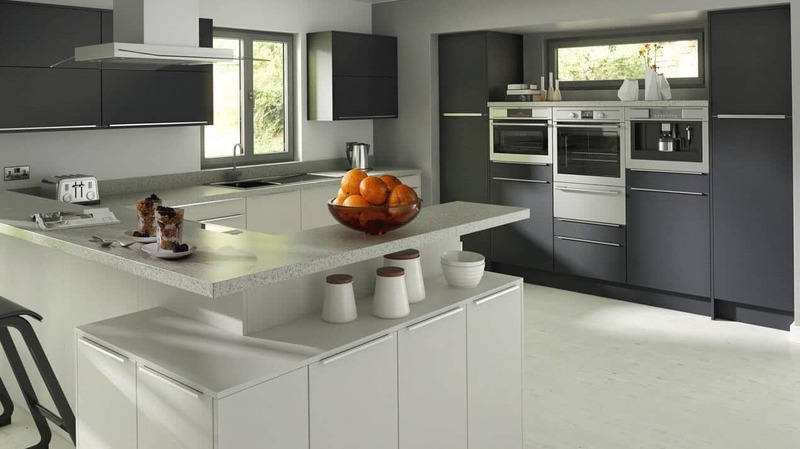 It is available in six sumptuous colours: Anthracite, Cashmere, Ivory, Light Grey, Truffle and White. 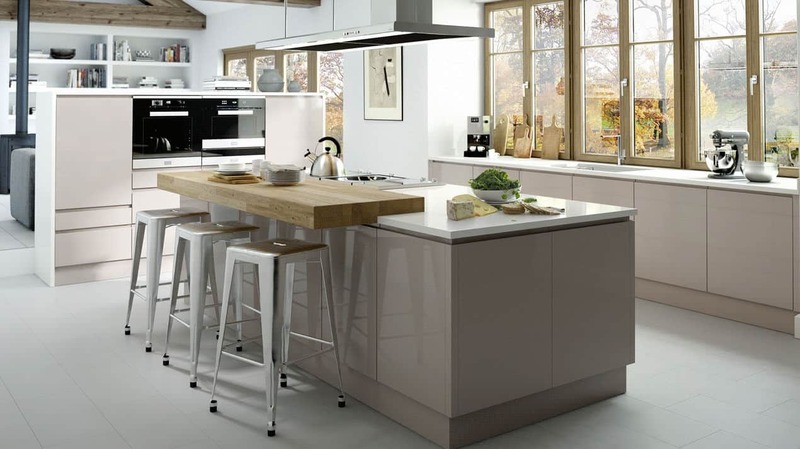 A stunningly simple kitchen that boasts clean, subtle slab doors with a warm wood effect. The extended island and seating area doubles as a modern living space. 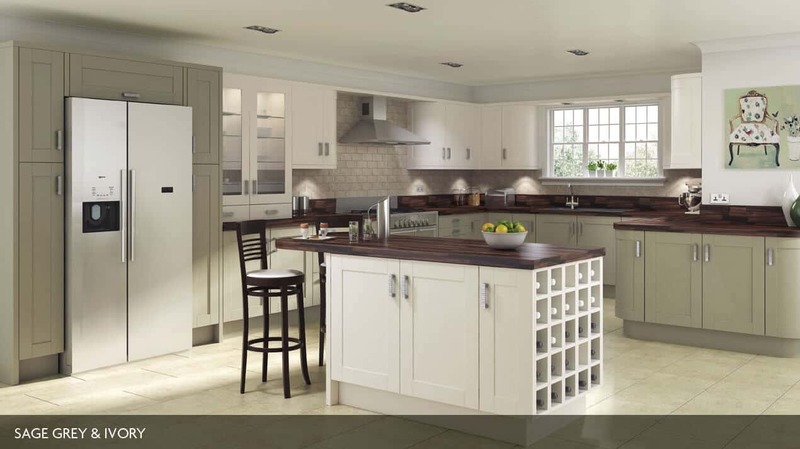 This beautiful kitchen combines modern design with finer details such as a luxurious wood finish and white avola. A gorgeous low sink completes the sleek setup. 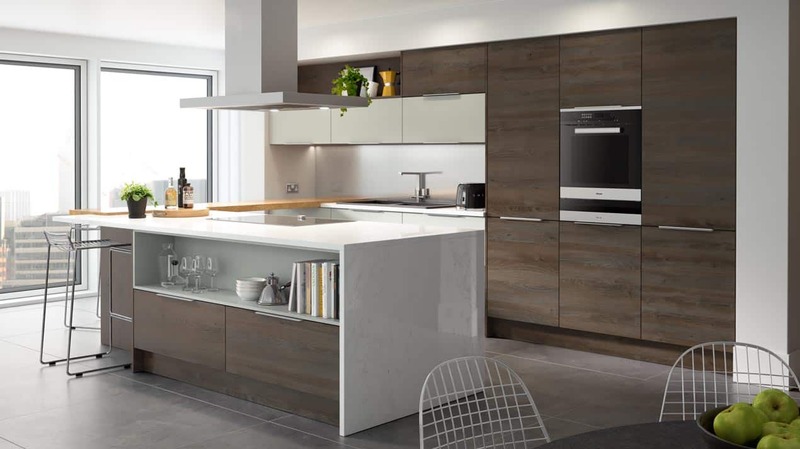 Perfect for the minimalist in all of us, this kitchen features an attractive open design and a choice of horizontal or vertical woodgrain. 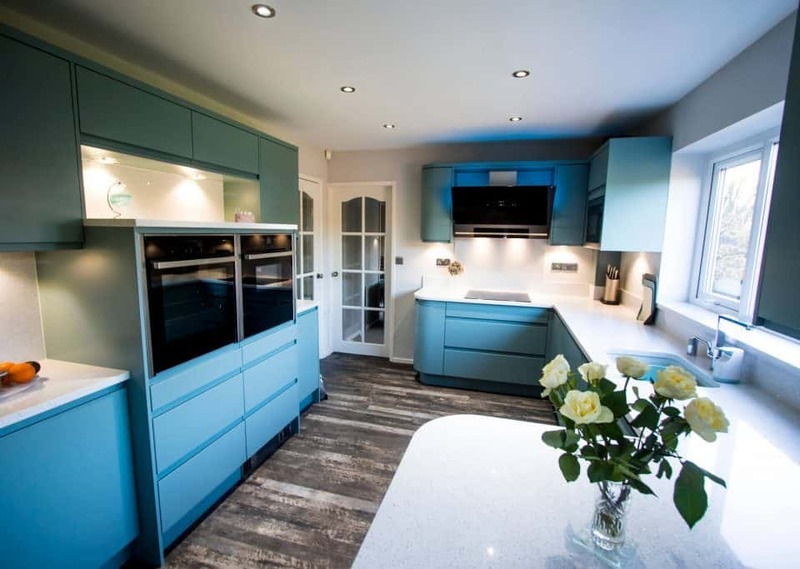 Whether you’ve found your dream kitchen or are just interested in knowing more about a particular design, feel free to call us today on 01706 826 557 or book a kitchen design consultation with us here.